John’s Horror Corner: Fire in the Sky (1993), mastering the fascinating terror of alien abduction. MY CALL: This is an excellent alien abduction movie and its effects and story remain strong despite the film’s age. Highly recommended to fans of the genre. 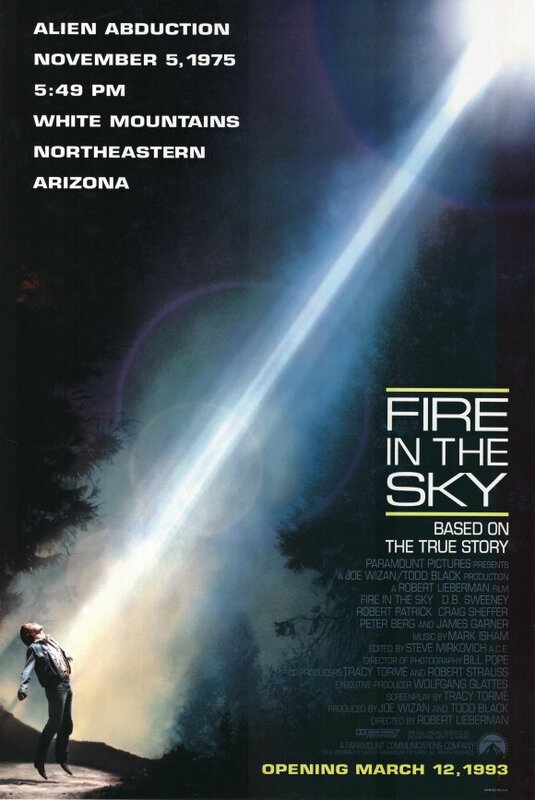 MOVIES LIKE Fire in the Sky: Alien Abduction (2014), Extraterrestrial (2014; which seems to be modeled after Fire in the Sky), Dark Skies (2013), Skinwalker Ranch (2013), The Fourth Kind (2009) and Communion (1989). Our story begins as Investigator Waters (James Garner; The Notebook, Maverick, Space Cowboys) is gathered to hear and record a rather unusual missing person report from a group of loggers. We flash back and forth between the actual events of the night before as Mike (Robert Patrick; Terminator 2: Judgment Day, The Faculty, True Blood), David (Peter Berg; Shocker) and Greg (Henry Thomas; E.T., Ouija: Origin of Evil) give their account to the suspicious Sheriff. The crew of woodsmen seem to get along, except for the now missing Travis (D.B. Sweeney; Taken 2, Spawn) and Allan (Craig Sheffer; Hellraiser: Inferno, Nightbreed). Diminishing any credibility in their story, Waters detects the obvious adversity in Allan’s peevish apathy of Travis’ disappearance, quickly making this more of an interrogation. They recall driving home from work in the woods to see a bright “fire” in the sky. Assuming it to be a forest fire, they continued, curious to discover the source. As if dazed or intoxicated with fascination, Travis stumbles out of the truck toward the light. The effects are, well, “very 90s” but competitive for its time (this wasn’t exactly a big budget summer blockbuster or anything). But I appreciate the red smoky mist radiating from the space ship’s undercarriage like an overheated vessel. Its surface shifts like magma before emitting the tractor beam upon Travis as his crew yell frightfully from the truck and flee before seeing what fate befalls Travis—adding yet more damning skepticism to their story. Too scared to think, they just yelled “he’s dead” and tore off into the darkness. “They took him,” they explain to Waters. But, not surprisingly, Waters expresses doubt in their flying saucer story as if he was actively “trying” not to believe this tall tale. And who could blame him? During the search party the next day their story continues to simply not add up. Days pass with no sign of Travis and the whole town comes to think they’re all liars or, worse, murderers! News crews and believers in extraterrestrials surface as the story goes national, but no evidence can be found to confirm their guilt or innocence. The entire second act hurls us into a crime mystery after Act 1 set the sci-fi stage. After 5 days Travis is found naked, with his humanity stripped away by the horror he surely endured. What happened to him? What did they do to him? The special effects behind the aliens and their craft were awesome and maintain my attention even today! Various chambers are enshrouded in membranes lined with slimy goop. The inner shipscape appears somewhat organic a la Alien(s) (1979, 1986), complete with snotty, mucousy, crusty textures throughout. This all aroused unease, but their “devices” instilled terror. This film and its cast embrace the bewildered terror of such an event and captured the admixture of fascination and horror that may intermingle one’s reactions to such unknown, even unknowable things. Much to my dismay, director Robert Lieberman (The Expanse, Rogue, Haven) turned to a career directing television. Having not seen it since the 90s, I remain impressed by how well this film held up. I’m strongly recommending this to anyone looking for a good alien abduction movie. Despite its age, the scenes remain powerful and the effects are sufficiently compelling. This movie is solid and I look forward to sharing it with more avid sci-fi fans! I watched this movie not long after it’s VHS release and fell in love with it. The visuals still pop it my head anytime I think of alien abductions, which is often enough to be weird. Before online shopping was a way to find everything, I remember always looking for it anywhere that sold movies. Fantastic movie that I have to share with my son. I thought about watching this again for the last 20 years (not exaggerating). All I remembered was when the alien vac-packed him in that stretchy sheet, cut open a mouth hole and slapped that greasy black goop in his mouth. That clip was burned into my mind even though I remembered nothing else.